Aires — in Japanese アイレス Airesu (like "eye-rescue" minus the "cue"); more fully K.K. 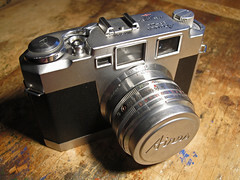 Aires Shashinki Seisakusho (㈱アイレス写真機製作所) — was a Japanese manufacturer of a number of 35mm and roll film cameras. It was based in Tokyo. 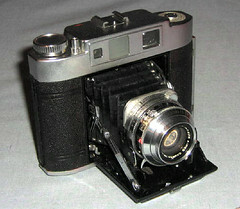 As Yallu Optical Co., Ltd. (ヤルー光学, Yarū Kōgaku), the company started in 1949 to produce the Yallu Flex, a 35mm TLR influenced by the Zeiss Contaflex. The Yallu Flex was ingeniously and elegantly designed and was well equipped and appealingly advertised, but in the end it was never offered for sale. About fifty were produced. Later cameras bore the name Aires. This page was last edited on 9 January 2019, at 09:25.